"The contribution of religious support: Post-traumatic growth in rural breast cancer survivors: by Savannah LeBarre & Dr. Ruth Riding-Malon"
"The contribution of religious support: Post-traumatic growth in rural breast cancer survivors"
Religious and nonreligious support in rural versus non-rural areas Breast cancer, although considered a traumatic experience, can lead to posttraumatic growth. Research has found that more survivors experience growth than posttraumatic stress disorder. While there are factors suggested to contribute to growth, there are inconsistencies found within the literature. One such factor, social support, is a malleable factor that could be beneficial for interventions to foster growth. Currently, there is no research on posttraumatic growth in rural areas. 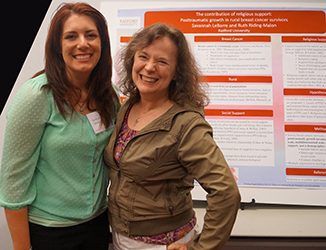 Due to fewer resources and a lesser likelihood of having peer support groups, along with an increased likelihood of religious supports, it is plausible that rural breast cancer survivors differ from non-rural areas on levels of posttraumatic growth. These relationships will be explored to ascertain whether geographical location and type of support matters within a breast cancer survivor population. Implications, limitations, and considerations for future research will be explored.